As an NTSB highway safety investigator, I’ve seen far too many fatal motor vehicle crashes. No matter how many times I’ve been deployed to investigate these crashes, each time I’m moved by what I encounter. When I arrive on the scene and see the devastation left behind—crunched, twisted metal that once resembled vehicles—I am immediately flooded with thoughts of the people involved. Maybe she was a wife and a mother; he might have been a husband and father; they were someone’s children. Was this person the family breadwinner or caregiver? Someone’s soul mate? A doctor, a teacher, a preacher, a business owner, a police officer, an athlete, a student, a stay-at-home parent? The reality that the people involved in these crashes are not coming home weighs heavy on me, both while at the scene and later, as I reflect on what I saw at the scene. But I’m not the only one affected. These tragedies have a tremendous effect on the families involved, as well as on their communities. In a single moment, lives are changed forever. And, yet, in almost every case, the accident was preventable. National Highway Traffic Safety Administration (NHTSA) data showed that more than 35,000 people were killed in traffic crashes in 2015—a 7 percent rise over the previous year. And nearly 5,000 of those killed were motorcycle riders or their passengers. That equates to about 14 people each day! That’s an unacceptable number. Motorcycles represent just 3 percent of registered vehicles, yet are overrepresented in our crash statistics. The fact is that riding a motorcycle is very dangerous—it’s 27 times more dangerous than driving a car. That doesn’t mean motorcycle riding is a bad thing, but the dangers associated with riding are something we must acknowledge and address. 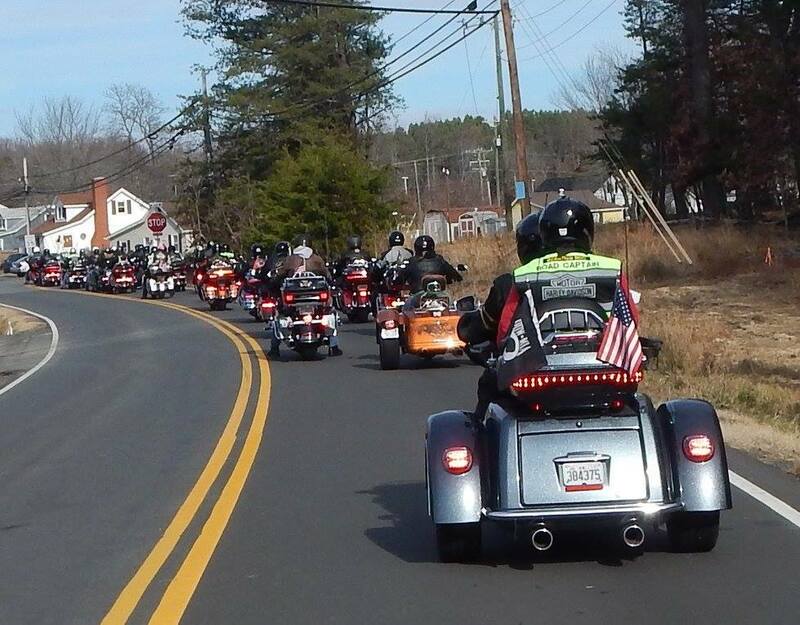 As the weather gets warmer and riders become anxious to enjoy it, more and more motorcyclists will emerge on our roadways, and I’ll likely be among them. I’ve been riding motorcycles for more than 30 years, beginning with a Honda 350 when I was in the Army stationed at Fort Bragg, North Carolina. For a while, my motorcycle was my only source of transportation. I also rode a motorcycle while I was stationed in Germany. When I came back stateside and left the Army, I bought a Kawasaki 454 LTD, which I rode for about 5 years before I transitioned to a Honda Shadow 1100 when I turned 40 years old. From there, I moved to the Suzuki 1500 Boulevard that I ride today. I love riding, and I appreciate these two-wheeled recreational vehicles. But when I get on my motorcycle, I remind myself that, because of its open, exposed design, I’m left vulnerable. Riding a motorcycle is dangerous and I must always be extremely cautious. With more than 30 years of riding experience and numerous years as an investigator, I have learned to be a defensive driver and take appropriate precautions. Wear safety gear—helmet, gloves, leather protective jacket, boots, and hi-visibility vest. Watch for road hazards and always leave a cushion around yourself. Conduct a pre-trip inspection, looking over the bike before you ride and making sure it’s in sound mechanical order. I hope that, as a society and a nation, we can work together to eliminate the loss of life we are seeing on our highways in all vehicle types. If you operate a car, bus, or truck, please watch out for motorcycles. If you ride a motorcycle, consider my tips above and put safety first. Recognize that riding a motorcycle is more dangerous than riding in a car, and it’s critical to take every precaution while riding. Enjoy the freedom of riding, but please, be safe out there! To read some of the motorcycle safety recommendations the NTSB has issued, visit our website. 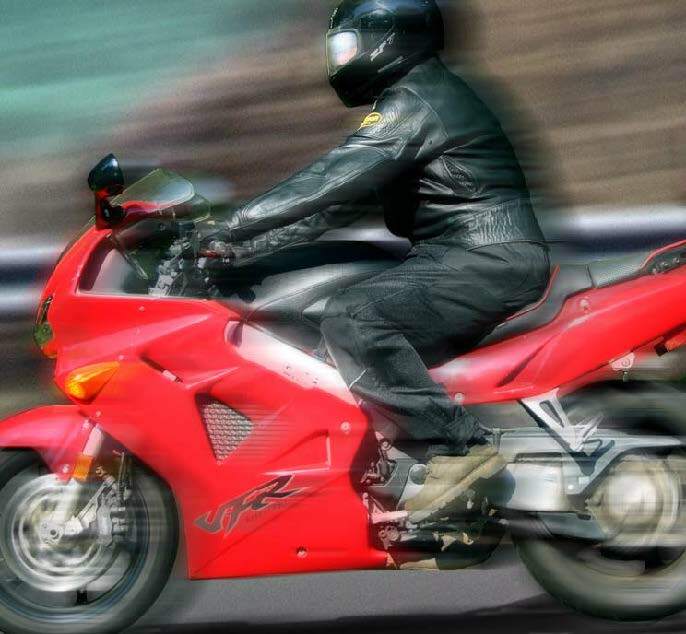 Also, see the latest NHTSA 2015 Motorcycles Traffic Safety Fact Sheet. Michael Fox is an investigator in the NTSB Office of Highway Safety. The vast majority of the miles I’ve logged as a motorcyclist have been as a solo rider, where I alone plan the route, set the pace, and determine when and where to take breaks. Riding alone, to me, reinforces the independence, mental solitude, and freedom I feel every time I saddle up. Riding alone allows me to easily ride at my comfort and skill level. I also enjoy large group rides from time to time, where someone else is responsible for the trip planning, and execution—and where I can just follow along a route with a bunch of folks who love riding as much as I do. However, riding close to so many others can lull you into a false sense of security or can create a sense of performance pressure—or both. Riding within your limits, or “riding your ride,” when in a group is one way to avoid these dangerous mental states and ensure a safe and fun ride. Just because you’re not leading the group ride, doesn’t mean you don’t have a role in planning the ride. The group leader should provide a pre-ride briefing that covers the route, planned stops, hand signals, and procedures to follow if the group gets separated or if a rider has an emergency. Actively listening and participating in the pre-ride briefing helps get your mind in the ride. Group riding is generally done in a staggered column of two within a single travel lane, requiring riders to maintain an interval with the biker ahead of them and the rider in the staggered position. It’s easy to get fixated on the mechanics of maintaining these intervals and to forget to continue your own scanning of the roadway. Seeing and evaluating potential risks and planning how to avoid or mitigate them is a continuous process for motorcyclists that doesn’t stop whether you’re in the lead, the middle, or at the tail of your group. The visibility that comes with riding in a group does not replace the need for you to identify your escape routes should an emergency – like an animal darting out into your path or a car encroaching your lane – arise. It’s also easy to feel a little pressured when in a group ride – the sense of a need to keep up, to take turns and curves at the group’s speed, to not get separated at a traffic signal, or to proceed through an intersection before you’re really ready. I have felt this pressure a couple times while riding in groups and I took a few twisties a bit faster than I would have if I were on my own. And now I know better. I learned to overcome that mindset by recognizing I’m riding with a group of friends – no one is judging me. These folks want me to enjoy the ride as much as they do, and they want to help me become an even more accomplished rider. I remind myself, in every group ride, that I’m going to ride my ride and that’s not only okay, it’s expected by the folks with whom I’m riding. If I’m riding my ride, I’m in my comfort zone. If I’m in my comfort zone, I’m more relaxed and less likely to panic or overcorrect in an emergency, and less likely to crash or cause a crash because I’m confident that my abilities match my environment. Motorcycle Safety Month is wrapping up just as the motorcycle riding season is shifting into high gear. Getting out with friends in group rides is a big part of the season and ensuring you’re riding your ride, every ride, is one way to make every ride a safe ride. For tips on riding in groups or the SEE (search, evaluate and execute) process, visit the Motorcycle Safety Foundation’s website at https://www.msf-usa.org/Default.aspx. Chris O’Neil is the NTSB Chief of Media Relations. When Will it Finally Click? The Crash Test Dummies, Vince and Larry, made their big debut in 1986, telling America, “You could learn a lot from a dummy . . . buckle your safety belt.” Based on the following increase in seat belt use, this public service announcement campaign became legendary and impacted many, and saving lives as a result. The amazing work that these dummies did earned Vince and Larry a retirement spot at the Smithsonian’s National Museum of American History. And yet, even today, not everyone buckles their seat belt, even though it has been proven over and over that a seat belt is the best lifesaving measure in the event of a crash. People still get citations during the highly advertised “Click It or Ticket” National Seat Belt Enforcement Mobilization campaign, which takes place over the Memorial Day holiday weekend. According to the National Highway Traffic Safety Administration (NHTSA), the seat belt usage rate in 2015 was 90.1%—which is great, except that the remaining 10% equals 27.5 million Americans who are not buckling up. That means 27.5 MILLION people are choosing to be unprotected in their vehicle. Buckling up is such a simple action, it only takes about 2 seconds. So, when will it finally click for everyone to buckle their seat belt? The National Safety Council predicts that 409 people may be killed on America’s roadways over the upcoming 2017 Memorial Day holiday period. I can’t predict every crash, but I can imagine that many of these potential deaths will occur because people chose to not buckle up. For them, it hasn’t clicked that seat belts save lives. 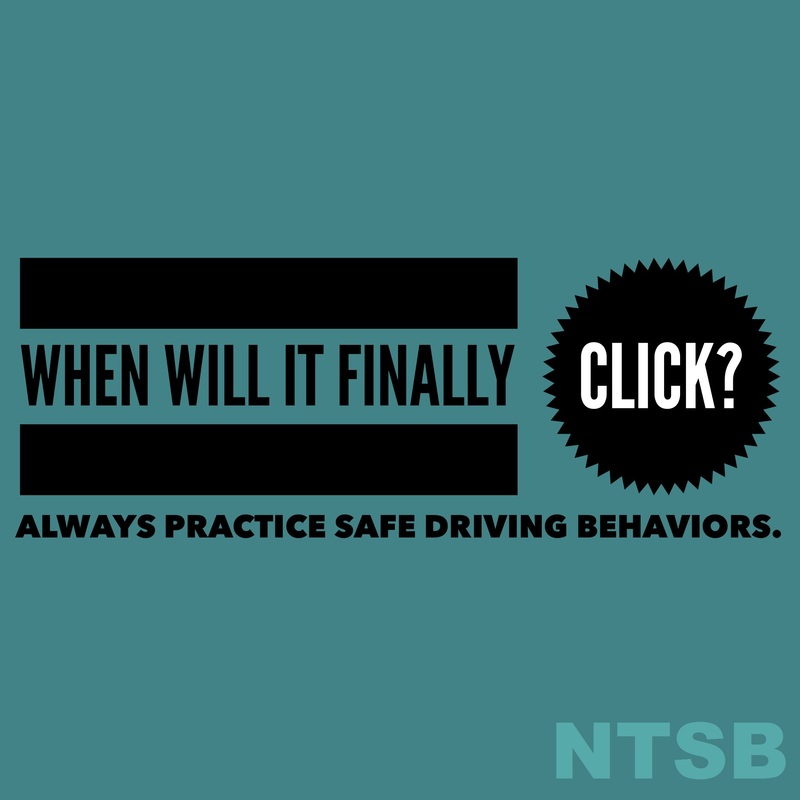 Other safe behaviors still haven’t clicked with many drivers, either. Driving while impaired by alcohol or other drugs, driving distracted, and driving while drowsy also contribute to the loss of life on our roadways. Simple solutions like driving sober or designating a sober driver, putting the phone away, and getting a full night’s rest would make the roads safer for everyone. When will all of this click for drivers? Memorial Day is a time to reflect and honor those who have fallen for our country. And, however you choose to observe the day—at the beach, at a bar-b-que, alone or with friends—I hope it finally clicks and you make safe choices to get safely to and from your destination. Leah Walton is a Safety Advocate in the NTSB Office of Safety Recommendations and Communications. Naturally, the NTSB has played a role in many of these initiatives in support of our highway safety recommendations; but it is often the work of advocates and brave legislators around the country that move states toward action on our recommendations. Unfortunately, despite these national and global initiatives, the numbers are trending in the wrong direction. After years of decline and plateau, the number of traffic deaths per year spiked in 2015 and 2016. When the 2016 numbers are tallied, it’s reasonable to assume that they will be the highest in a decade. The cultural shift we need to stop this trend will take greater education, legislative, and enforcement efforts. In our April 26 roundtable, “Act 2 End Deadly Distractions,” we brought together advocacy groups, insurance companies, survivor advocates, and law enforcement representatives to discuss the problem and identify specific solutions. Survivor advocates went away with new tools and contacts, as well as with information on how to take more effective action to move the public, state and local governments, employers, and law enforcement. The assembled advocacy groups announced an alliance, the National Alliance for Distraction Free Driving. 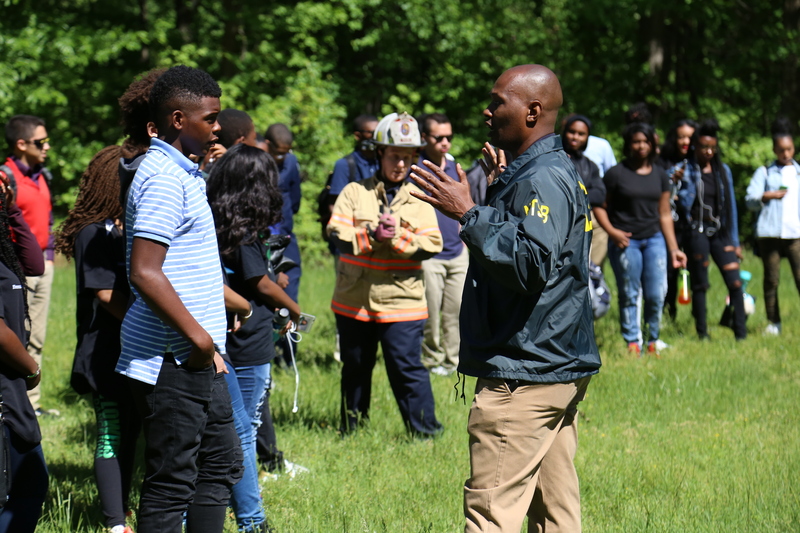 Earlier this month, the NTSB’s Advocacy Division collaborated with Prince George’s County (MD) Police Department, the National Organizations for Youth Safety (NOYS), and Freedom High School in Virginia to educate youth about driving hazards. Together, we kicked off our Global Youth Traffic Safety Month social media campaign, #1goodchoice, to promote teen driver safety. 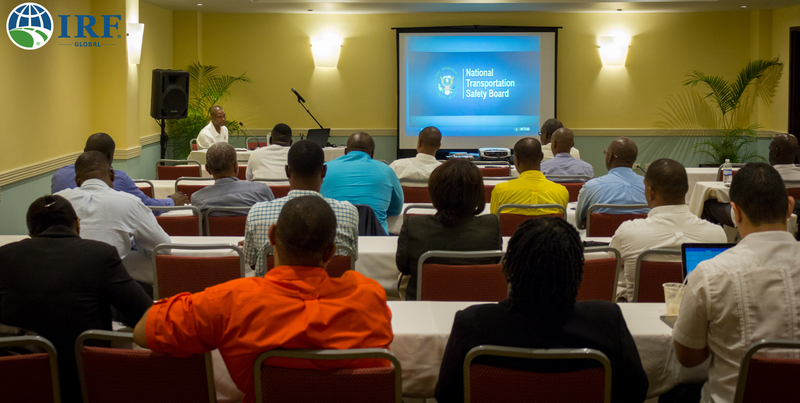 Last week, I represented the NTSB at the International Road Federation’s 6th Caribbean Regional Congress. At the meeting, I emphasized the “service” part of civil service and shared what NTSB Advocacy has learned in promoting action for safer driving and safer roads. Even as safety features become more and more common, our driving behavior has not become safer. We must change behavior to make a real difference, and that change in behavior starts with ourselves. The first step to making this change is realizing that those who die in highway crashes are not some “other people”—they’re somebody’s loved ones. They were somebody, themselves. They could have been us. You can take action to increase awareness—your own as well as that of those around you. Turn away from messages about how much we can drink before driving, for example, and think instead about separating the two behaviors. Realize that, whether you’re speeding to make a red light or glancing at your phone while driving, it can wait. Get enough sleep before driving. Wear a helmet when you’re on a motorcycle. Be alert to pedestrians and bicycles, and be alert as a pedestrian and a bicyclist. Reach out to people you know, either through social and traditional media or by simply having a face-to-face conversation with your loved ones and friends about the behaviors they need to change when they’re on the road. Act to end distractions by joining the conversation at #Act2EndDD. You can talk about your one good choice (#1goodchoice). If you’re a survivor advocate, you can get in touch with the National Alliance for Distraction Free Driving for tools and ideas on how to put an end to distracted driving. If each of us changes our own behavior, we will create a safer world. We must all take responsibility and act to keep drivers, passengers, pedestrians, bicyclists, and motorcyclists alive. On the night of May 14, 1988, in Carrollton, Kentucky, 24 children and 3 adults were killed and 34 others were injured when a drunk driver, driving his pickup truck in the wrong direction on Interstate 71, struck their church activity bus head-on. The driver, whose blood alcohol concentration was three times today’s legal limit, survived, sustaining minor injuries. In the nearly 3 decades since the Carrollton crash, the number of people killed in alcohol‑involved crashes has decreased. Smart, committed people have worked tirelessly for stronger penalties, high-visibility enforcement, advanced collision-avoidance technology, and education campaigns aimed at deterring alcohol-impaired driving. But more than 10,000 people still die every year because someone who has been drinking gets behind the wheel. The results of those drivers’ choices are funerals, hospital stays, surgeries, medical bills, and lost livelihoods, all of which are completely preventable. As we approach the 29th anniversary of the 27 deaths in Carrollton, 27 more people will die today, because of alcohol-impaired drivers. On the 25th anniversary of the Carrollton crash in 2013, we issued a safety report, Reaching Zero: Actions to Eliminate Alcohol-Impaired Driving. We called on the states to take bold actions to address this problem, making safety recommendations in this report that, if implemented, would prevent alcohol-impaired driving. We recommended reducing the per se blood alcohol concentration limit for all drivers; conducting high-visibility enforcement of impaired driving laws and incorporating passive alcohol-sensing technology into enforcement efforts; expanding the use of in-vehicle devices to prevent operation by an impaired driver; and using driving while intoxicated (DWI) courts and other programs to reduce recidivism by repeat DWI offenders. Implementing any of these recommendations would reduce impaired-driving fatalities, and if any one of them can keep one impaired driver from taking another life, we believe the effort to enact them is worth it. If these recommendations had been in place in 1988, those 27 bus occupants might be living full lives today, and 24 families may not have experienced unspeakable sadness. Dr. Robert Molloy is the Director of the NTSB Office of Highway Safety. Today is the first day of the United Nation’s Global Road Safety Week. The week was started as part of the Decade of Action for Road Safety 2011–2020, and now builds momentum to achieve the worldwide UN Sustainable Development Goal of reducing by half the number of deaths and injuries on the roads by 2020. This year, the theme is #SlowDown, and the safety focus is on speed management. At the NTSB, we investigate some of the worst motor vehicle crashes each year, and speed has been a factor in many of our investigations. We recognize that speed often contributes to the severity of a crash, and we are addressing this safety issue through our recommendations to improve work zone safety, to require and improve collision avoidance systems, to develop V2V technologies and require installation in all vehicles, and to improve speed-limiting technology for heavy vehicles. In fact, to highlight the importance of speed on safety, the four Board Members of our independent agency approved a special study on speeding, which we anticipate releasing later this year. Our federal colleagues at the CDC Injury Center remind us that speeding is a major risk factor for crash deaths, and that almost 1 in 3 deaths on our roads involve speeding. NHTSA data show that speeding-related deaths increased by 3% from 9,283 in 2014 to 9,557 in 2015; speed is clearly a continuing safety issue. We probably all need to #SlowDown a little in our hectic lives, both on and off the road. Perhaps like many of you, I race around every day juggling work and family life, and I rarely stop to enjoy things as much as I should. When I was younger, unlike the wise FCCLA youth whom I met recently, I probably raced around a little too much on the roads in Texas. One of my older brothers was my willing partner then, but now, we both know that our speeding could have had devastating consequences. That brother grew up to be a surgeon who spends many hours working in emergency departments and operating rooms, so, like me, he also sees the tragic consequences of speeding. Meeting the smart and capable youth from the FCCLA, some of whom have conducted Teen Road Safety Assessments (#TeenRSA) around their schools, reminded me that we all need to remember to lower our speeds, especially around schools, to protect the most vulnerable and promising members of our society. Lower speeds really can save lives. A child hit by a car going 50 mph almost certainly will die, but perhaps a child hit by a car at 20 mph can survive. At slower speeds, a car could avoid hitting a person (or another car) altogether. Let’s #SlowDown this week, and every week, for our children and our communities. On April 26, I found myself echoing this saying from the Talmud more than once at “Act to End Distracted Driving,” a roundtable hosted by the NTSB in collaboration with Stopdistractions.org, DRIVE SMART Virginia, and the National Safety Council. The roundtable brought together survivor advocates to facilitate more effective action on distracted driving. It was a moving and insightful day, with participants expressing the impact that distracted driving has had on their lives and on the lives of their loved ones. Survivor advocates spoke about trying to give a voice to those who can no longer speak for themselves, turning their personal tragedies into effective advocacy efforts to prevent others from going through what they have gone through. Incredibly, many survivor advocates expressed frustration that they had not done enough. Here are some of the takeaways from the roundtable. But this “club” exhibited incredible mutual support, gritty determination, and smart strategy, even as its members revisited their losses, relived their grief, and shared their stories. From passion to action. Survivor advocates took their passion and turned it into action. We can all be advocates. If this could be you . . .
Everybody processes grief differently. But if you are a survivor who wants to be an advocate, or if you simply recognize that distracted driving requires a big change in our laws and culture, there is somewhere to turn. Advocates have worked together to form the National Alliance for Distraction Free Driving. On its website, you will find advocacy resources, templates for presentations, videos, and other tools contributed by many organizations working to turn the tide against deadly distractions. You, too, can make a difference and save lives. Next time someone calls you and you know they are driving, ask them to call back once they’re not behind the wheel. Next time you are with a driver who attempts to text, call, or post something on social media, politely ask them to stop. After all, we are all in this fight together.